What’s Really Behind America’s Slumping GDP Growth? On December 6, the Gallup organization together with the U.S. Council on Competitiveness published a jolting study demonstrating that the pervasive sense among Americans that the U.S. is in economic decline isn’t imagined. It’s real and it’s dangerous. The study was conducted by Gallup’s Senior Economist, Jonathan Rothwell, with other Gallup experts and external scientists serving as reviewers to “ensure statistical and theoretical accuracy and objectivity,” according to Gallup Chairman and CEO Jim Clifton. 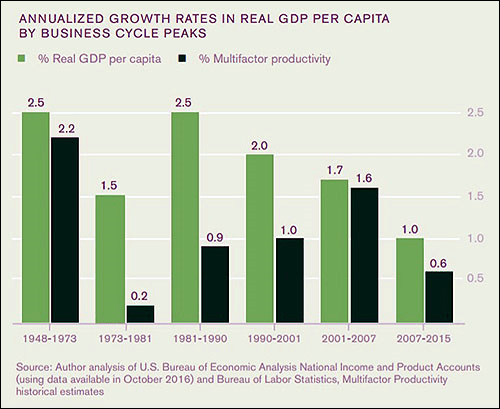 “Another theory for why productivity growth has slowed is that demand for investment has fallen. Reviving a theory from the 1930s, Larry Summers has argued that the fundamental problem is a lack of investment opportunities. Summers provides few details as to why he thinks investment demand has fallen, but he argues that large-scale government-funded investment is a potential cure. Yet, weak demand for investment may be an effect of a still more fundamental change. Lower real wage growth, for example, would depress opportunities for businesses to form or expand, depressing investment. So, if Summers is right, the question remains: Why has investment demand become so weak? If consumers could afford to buy new goods and services, then businesses would have a strong incentive to invest in providing them.